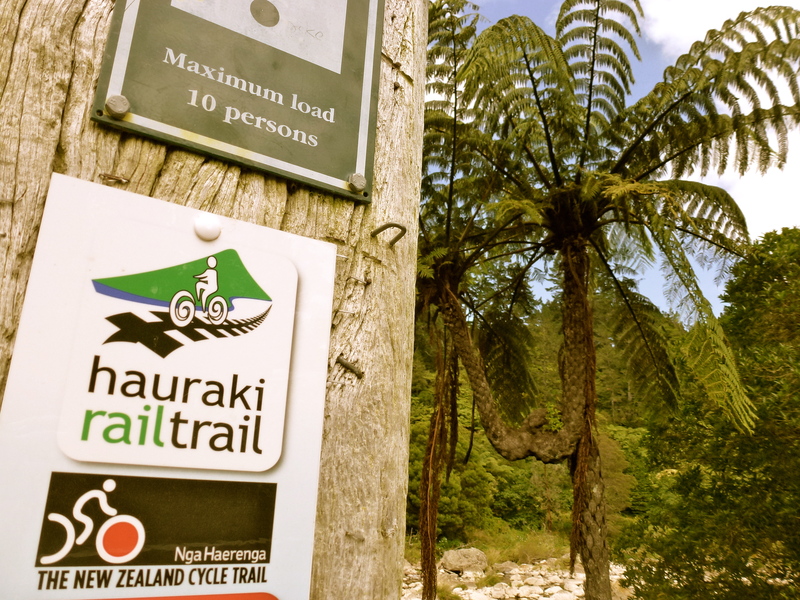 I am finally home in New Zealand and the gravel flicks out from under my wheels as I weave my bike around this fabulous trail. My young niece and nephew are squealing in delight enjoying the rush of the air on their faces as their parents happily pedal with them in tow. The tops of the fern trees cast shadows to cool us from the blazing sun. 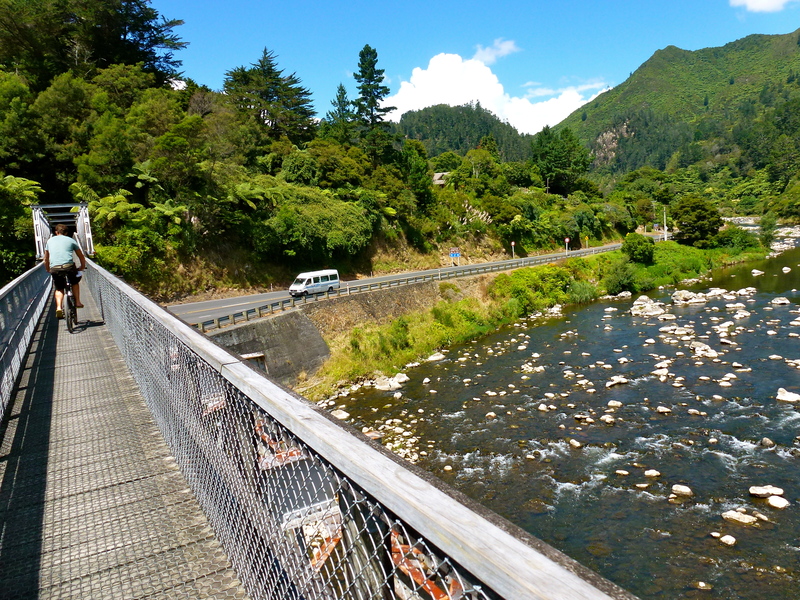 We cycle further into the magical depths of the Karangahake Gorge. 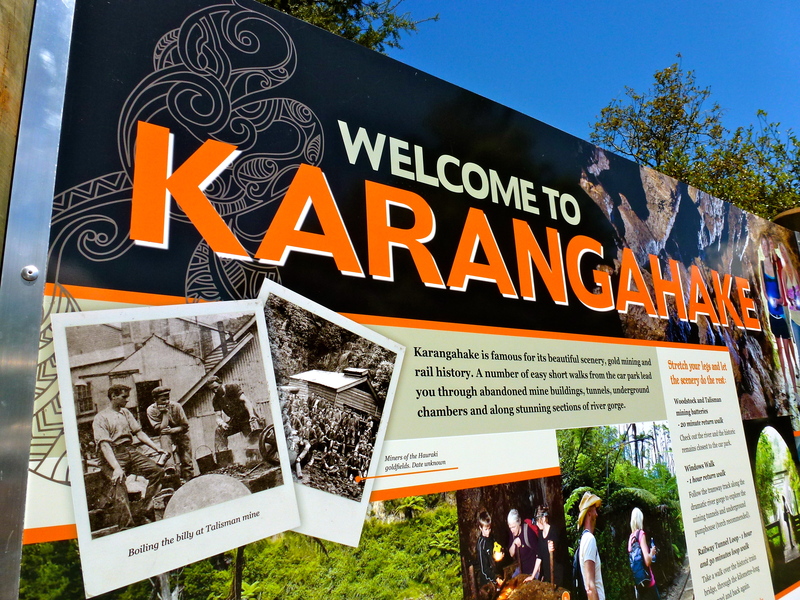 In the Gorge there are various walking and cycling trails that combine New Zealand’s natural beauty and a history of gold mining. 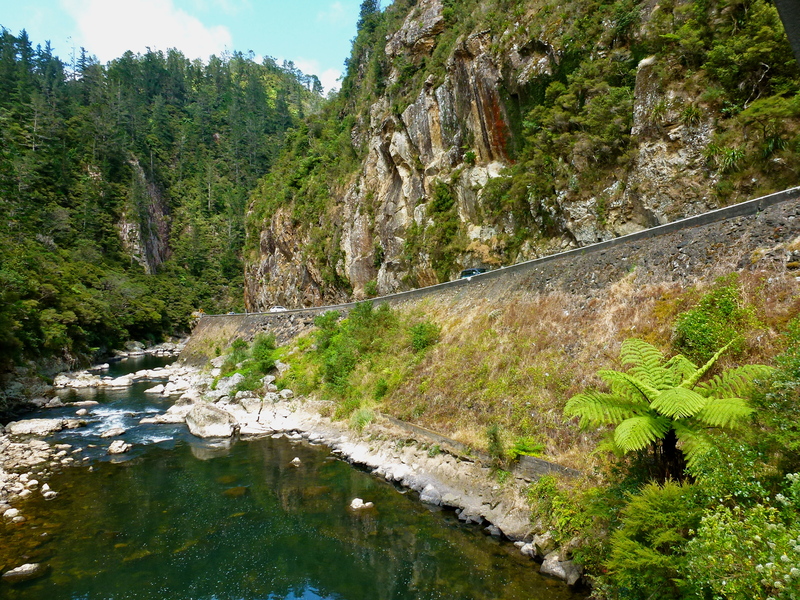 The Karangahake Gorge can be found on the busy State highway 2 between the small towns of Paeroa and Waihi. The winding road weaves its way through the gorge with vehicles hugging tight corners to stop them from slipping into the Ohinemuri river below. 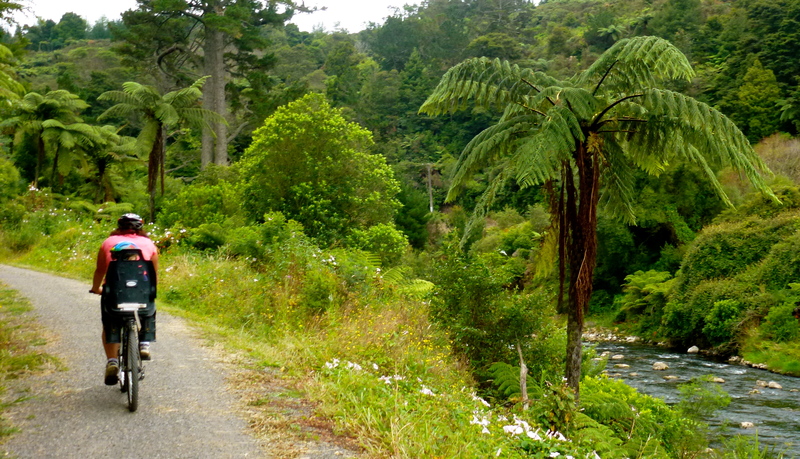 The Karangahake cycle trail is a small completed section of the Hauraki rail trail. 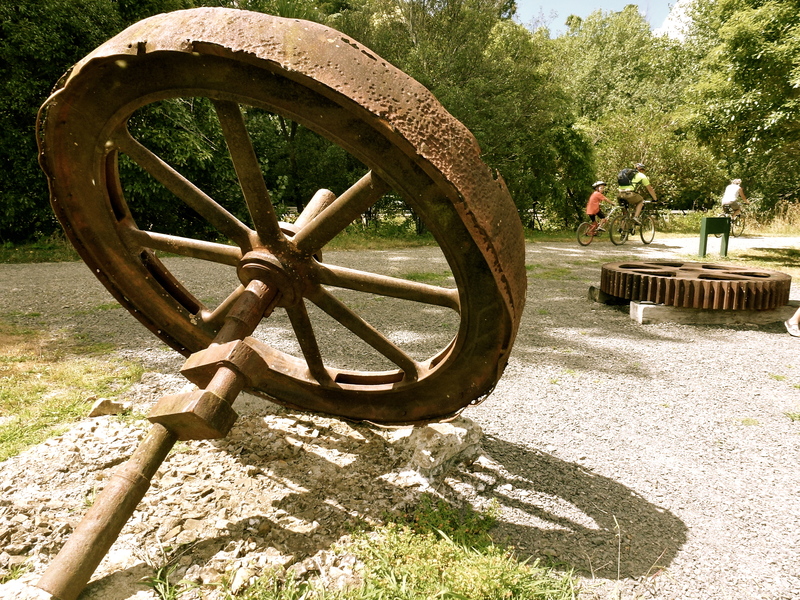 This trail is part of the New Zealand Government’s big plan to create 18 Great Rides that will take cyclists through some of New Zealand’s most iconic and picturesque countryside. These rides are expected to offer more than 2,000km of trail once completed. The rusty relics of the mining era are placed randomly beside the trail. We pedal past Victoria Battery. 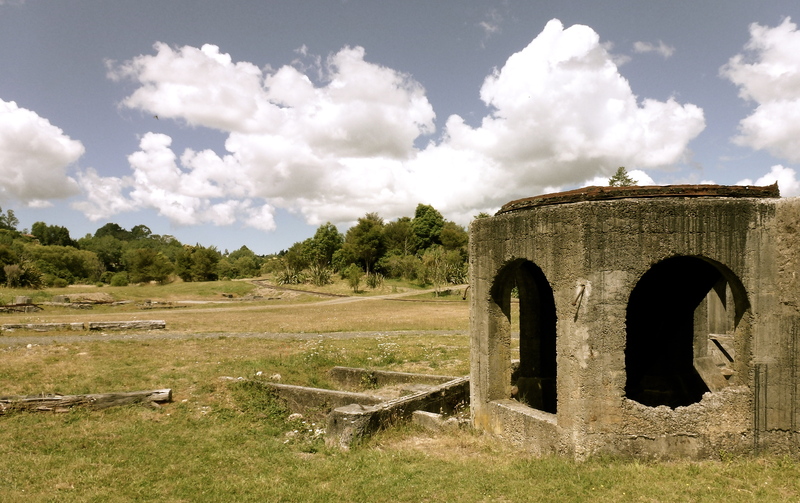 It was erected in 1897 to crush quartz and was once considered the largest and most advanced facility of its type in New Zealand. It now looks like a concrete rotunda sitting all alone and redundant. The trail follows the slow flow of the Ohinemuri river below. 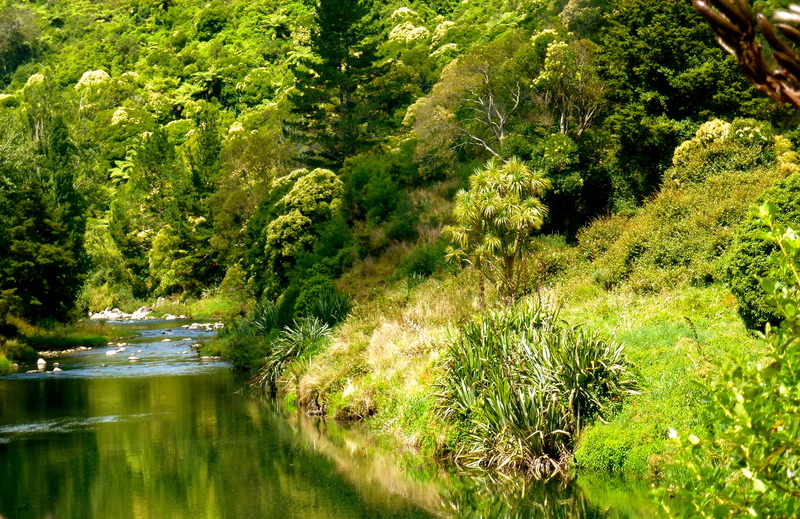 The river bank is overgrown with leafy trees, bundles of flax and wild grass. The dense canopy of fern trees cover the climbing hillside, their spidery branches stretch out over the bush trying to achieve a higher status of other plants. The tune of the chirping cicadas surround us as small birds flutter through the many native trees. We cycle over old railway lines and across a wooden bridge, stopping to throw stones into the river below. 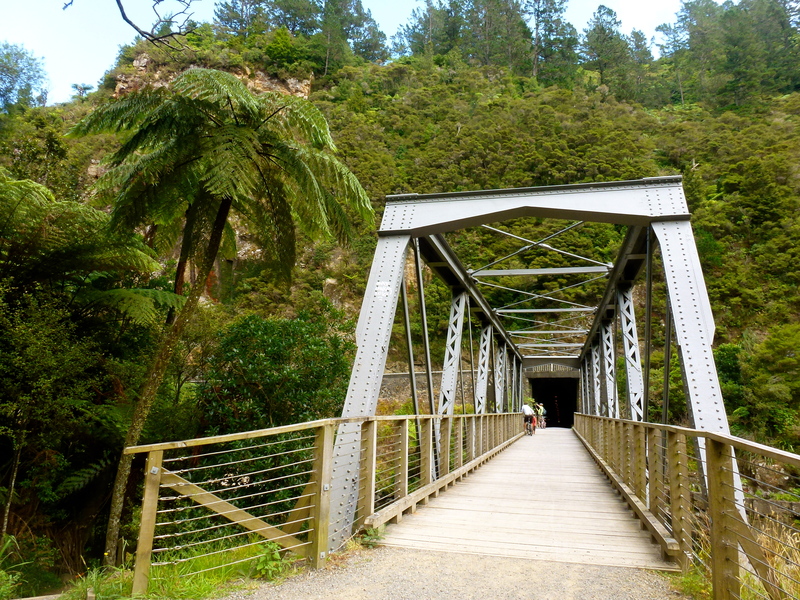 The gravel trail continues to cuts it way into the gorge and we follow its path to a bumpy bridge that takes our bicycles into a lengthy old railway tunnel. The spooky tunnel is over 1km long and is dimly lit. We all hoot and holler listening to our echos as they bounce off the walls. In the tunnel we pedal with care trying to avoid any oncoming walkers. Big cold drops of water randomly fall from the ceiling feeling like a ghostly finger on our skin. Our wheels spin through muddy puddles as we head for light at the end of the tunnel. Blinded by the glare of the sun we exit the tunnels dark depths and pedal over a narrow bridge. 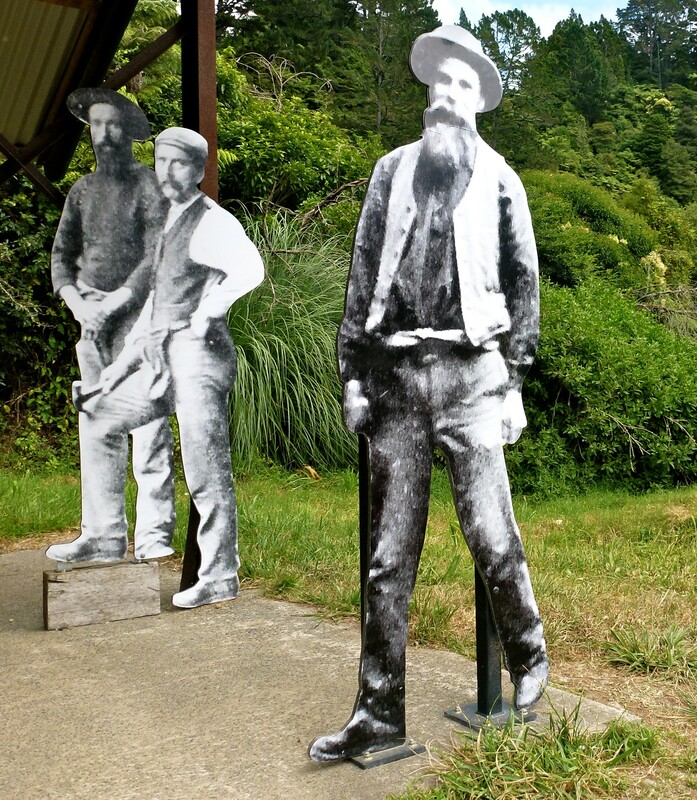 It takes us over the top of the rumbling trucks on State highway 2 to more gold mining ruins. 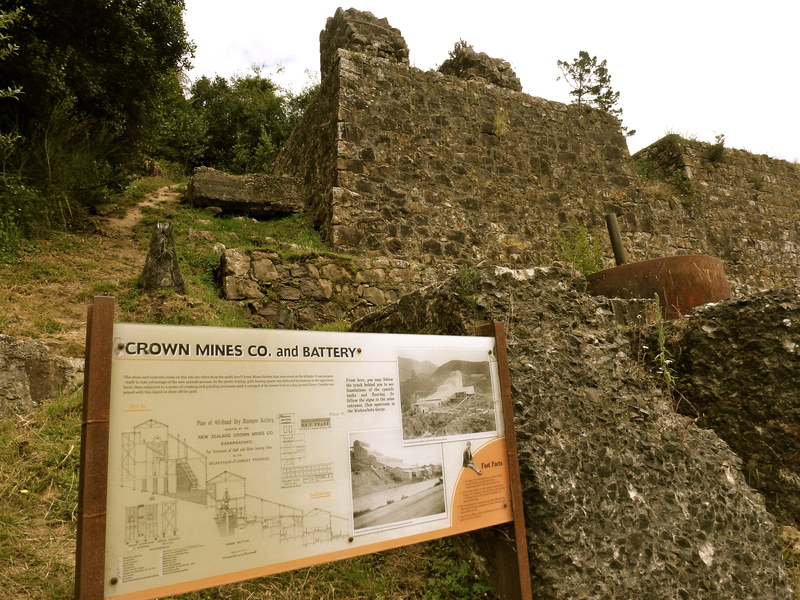 The Crown battery foundations sit in derelict ruin and have been left as a reminder to what working life was once like here. The children enjoy climbing in, on, under, up and over all the old relics. What was once a busy work place is now an adventurous playground for tiny hands and legs! We encounter a few short, but steep climbs. We turn a bend and are greeted by a great view of the Ohinemuri river as it zips in-between and around hundreds of smooth rocks. Finally we see the end of the trail and a big swing bridge that will take us there. We spot the Talisman cafe across the state highway 2 and decide to rest in among its arms and enjoy its welcome. It is nestled under the shade of native trees and all of us enjoy cool drinks and plates of delicious cafe food on a picnic tables. Well fed and rested we return back along the trail enjoying everything again for a second time! We stop on the wooden bridge so the children could throw giant leaves over the side. They enjoy running to the other side to see them float under, and down the river. While my sister keeps the children busy, the rest of us make a quick detour to find the Owharoa falls that is sign posted up a small country road. It is worth the detour! 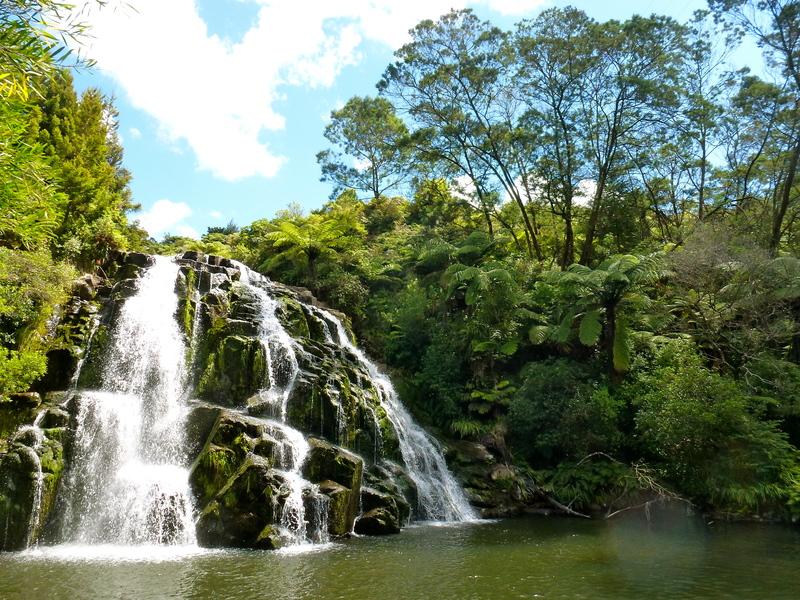 The water cascades over a huge mass of rock into a very inviting swimming hole. The day is topped off with a visit to Waihi beach. The beach had been closed for a while due to the Rena oil spill – a major environmental disaster. The locals have obviously worked extremely hard to clean up the mess as the sea was shimmering in the sun, the sand was paper white and a whole generation of New Zealanders were splashing about in the water enjoying the summer season so we joined them! A perfect end to a perfect day! These images and more can be found on my Facebook page – Enjoy! 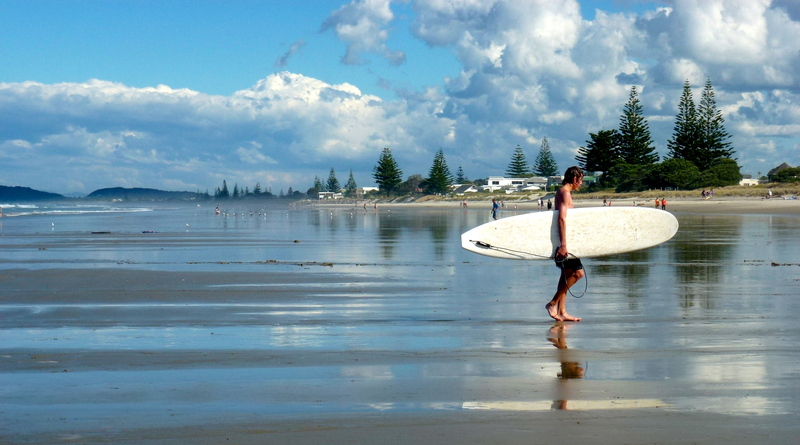 This entry was posted in cycling, New Zealand and tagged beach, bicycling, blog, children, cycling, history, life, nature, New Zealand, photography, travel, writing. Bookmark the permalink. Hi, can you tell me where you started and ended on the trail, and how long it took for you to ride the trail? I’m looking to do a easy ride with my 60 year old parents. This seems perfect for us. You can start at the little rail cafe at Waikino or if you want a longer pedal start from Paeroa. Check before you go though as mining as been given the go ahead in the area and parts may be closed. Very sad to hear as it is a truly special place. A couple friends of mine moved to New Zealand a few years ago. The photos they sent me were absolutely gorgeous. (I live in Florida, U.S.) Reading your blog and seeing your photos reminded me of them. Thank you for that. It looks like its a beautiful country. – – Loved the Grand Canyon pictures too. I hope to visit there soon. Thanks for stopping by. You will love the Grand Canyon! I would say this was one of your best posts ever, but I seem to say that about all your posts! Brought back memories of Ross, our New Zealander guide during our Canadian Rockies bike tour. His good humor and NZ stories made us want to visit “Birdland”– perhaps one day we’ll make it! If so, I definitely want to take this ride. Seeing those relics, I can’t help but wonder if in another hundred years, new generations will be cycling past our own ruins, shaking their heads in amusement. It is always a pleasure to hear from you Mark – Thank you for your lovely comments and I hope you do make it to New Zealand one day – I am sure you would enjoy all the scenic beauty that is on offer! the day there. Cycling is the way to go!! What are the rules about trout fishing in the river? Love the Blogs Keep them up. You would love it – I already want to go again! Looks awesome! Have always wanted to ride in New Zealand. Thanks for sharing. Beautiful country roads, must have been relaxing. It was very relaxing and very hot! Thanks for stopping by!